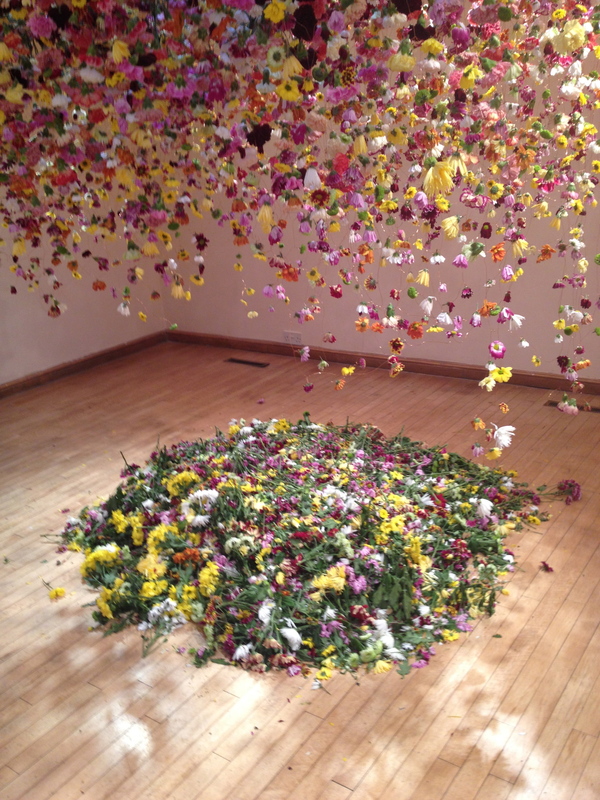 there has been a slightly feverish need to get a horticultural fix in the city wherever it can be found. The weather app on my iPhone last Tuesday foretold that despite black skies and continuous sheets of rain all morning – it would be sunny in the afternoon. By 1pm I could sense there might be some truth in this. I slammed the front door behind me and headed speedily for the Chelsea Physic Garden, lured by the idea of witnessing a snowdrop theatre and the knowledge that this beautiful walled garden in which grapefruit and pomegranates ripen to full size -outdoors! – would be the most sheltered place I could find if the weather suddenly turned on its head. 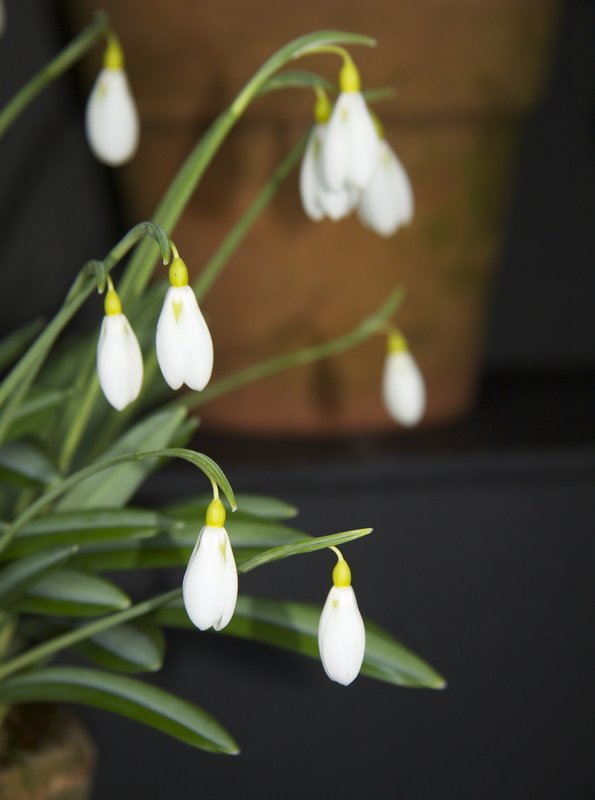 Despite its glamorous appearance, ‘Diggory’ is a vigorous snow drop, if fairly slow to increase, and would work perfectly happily in a semi-shaded garden situation. But I soon fell, even more seriously, for another, quieter, utterly lovely snowdrop, Galanthus plicatus ‘Wendy’s Gold’ : I love the slight glow of its rich yellow markings and the slim bell-like simplicity of its petals. ‘Wendy’s Gold’ is the favourite snowdrop of botanical artist, Helga Crouch http:/www.wildlybotanical.co.uk whose storybook garden in Essex I have written about for the December 2014 edition of Gardens Illustrated Magazine. 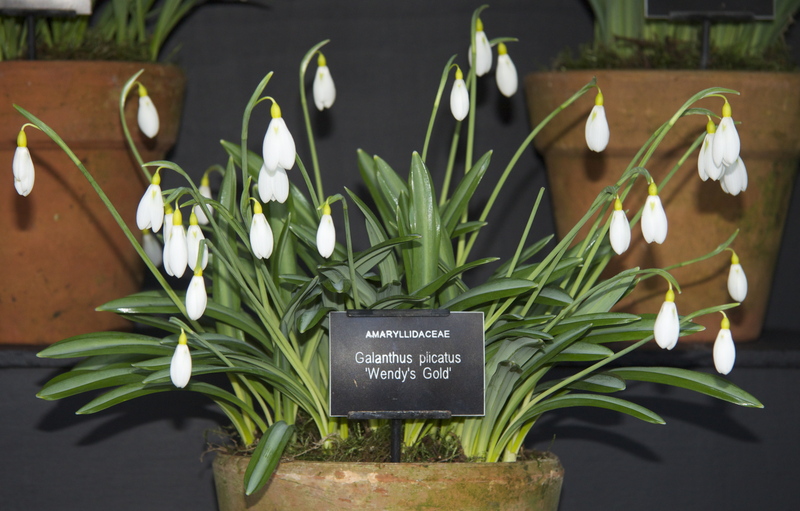 Helga has a reliable eye for the exquisite and it was brilliant to see ‘Wendy’s Gold’ for myself, better still to learn that it is again an easy garden snowdrop and best of all to be able to buy some there and then at the Physic Garden. 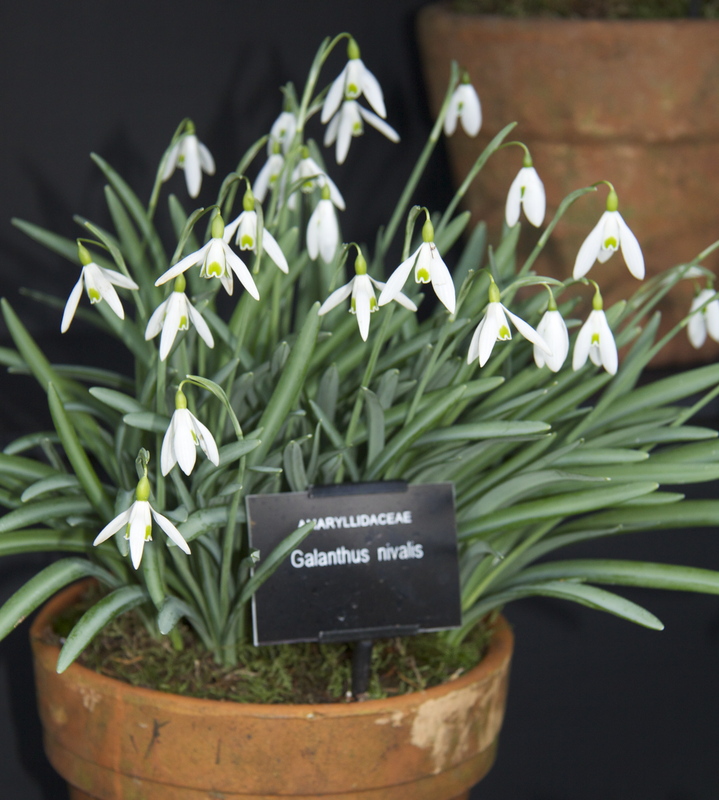 But it was also riveting, within the perfectly groomed context of the snowdrop theatre, to see that the darting elegance of the common snowdrop, Galanthus nivalis holding up so extremely well against its less well known – and more expensive – rivals. 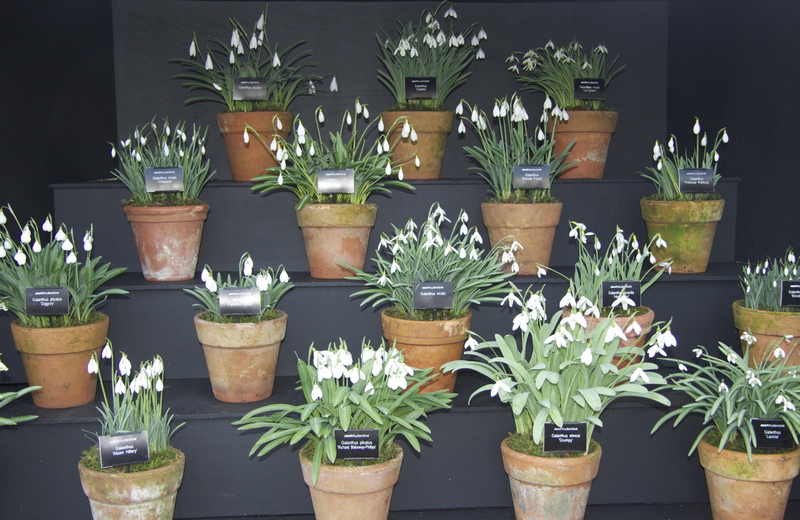 Naomi Slade was giving a talk at the garden when I visited and spoke about the different approaches to planting snowdrops in pots. 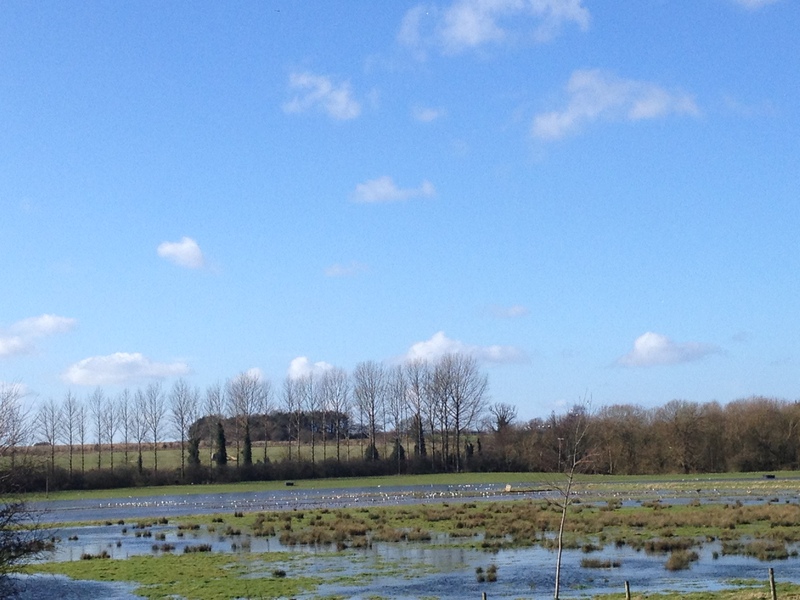 There is also really helpful practical advice on the website http://www.galanthus.co.uk. The main reason that collections of snowdrops are kept, preciously and expertly, in alpine houses is to get the watering regime right. 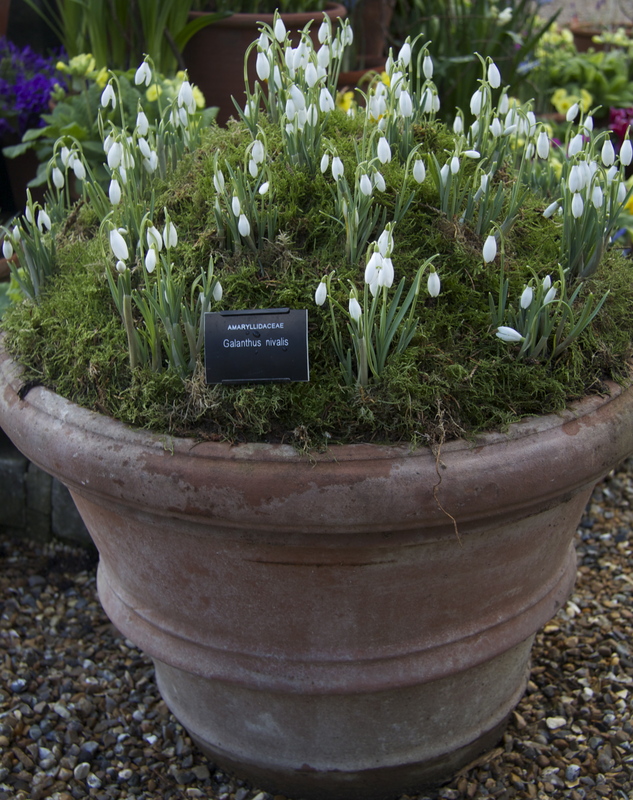 Potted snowdrops need watering throughout their full growth cycle, not just when they are in flower. 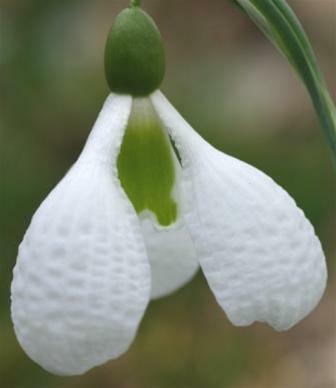 If they are allowed to get dry and badly wilted, ‘even once’ says Galanthus, (this is where gardening can feel seriously intimidating), the bulbs are likely go dormant prematurely and may take a couple of years to flower well again. The pot should never be allowed to freeze either – snowdrops are fine, of course, when the ground is frozen but they become vulnerable when in freezing temperatures above ground. But most gardeners agree that it is still worth a try. 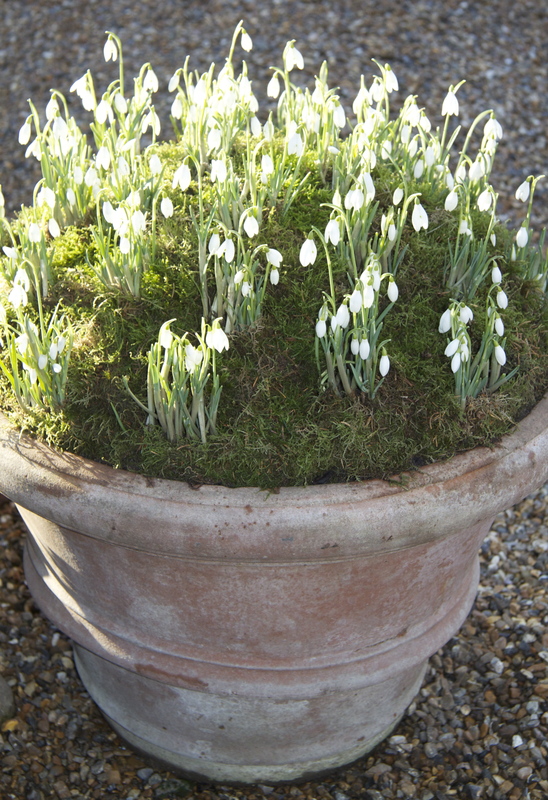 The best chance of success is to use a large container and fill it with a thoughtful compost mix – Naomi’s recipe is for John Innes, leaf mould, bonemeal and grit – which, snow drops being greedier than you might think both in pots and in the ground – you replenish every year. 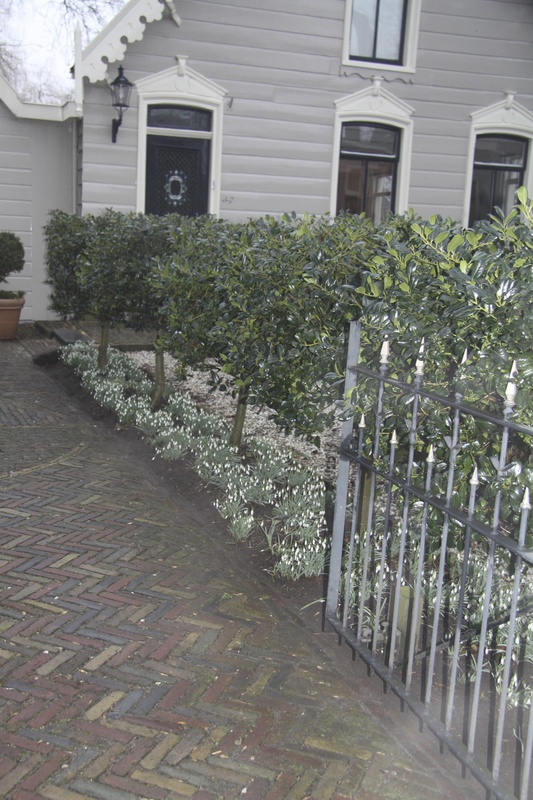 In a shady, city garden Naomi proposed a large pot with snowdrops for the early spring and a handsome hosta for summer. 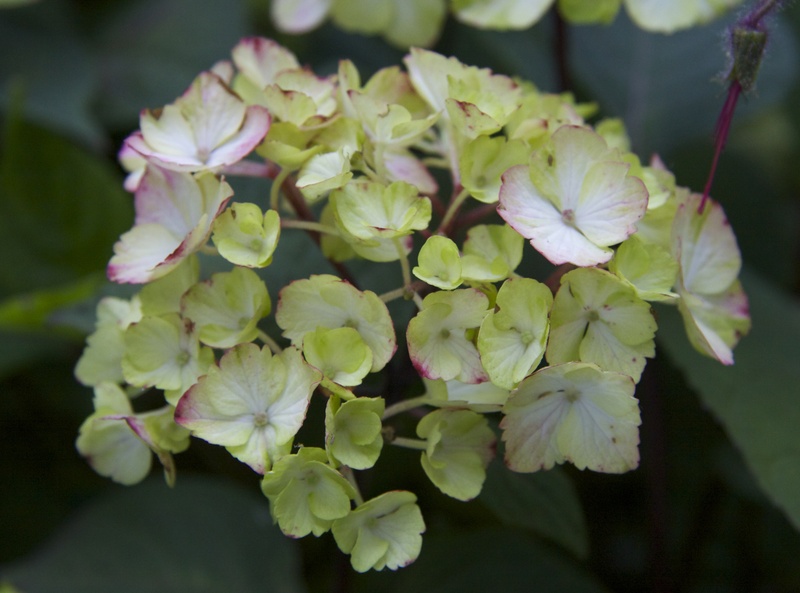 I recommend snow drops planted at the base of the compact, reddish-green Hydrangea preziosa which work brilliantly well in a container and are, of course, bare stemmed at this time of year. 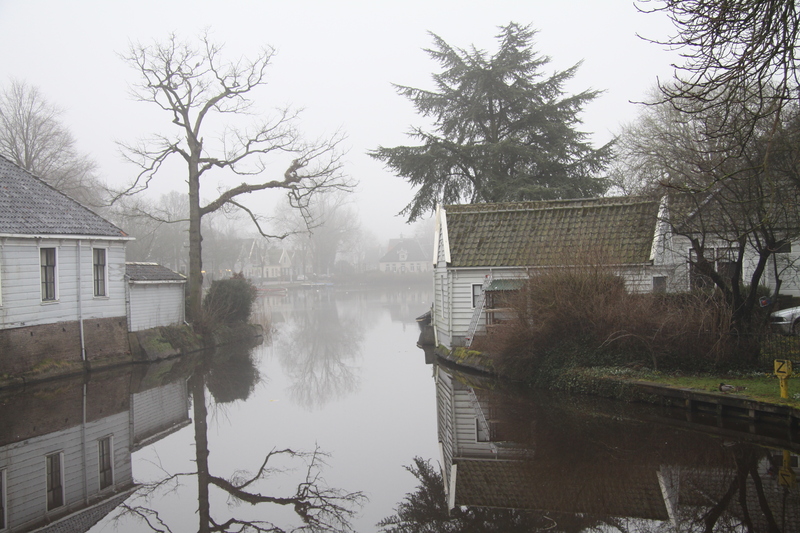 One of the most effective use of snow drops I have seen in a small garden is in the front gardens of the beautiful painted 17th Century wooden lakeside houses in Broek in Waterland just outside Amsterdam – a cosy and atmospheric place to stay if you are visiting the city. 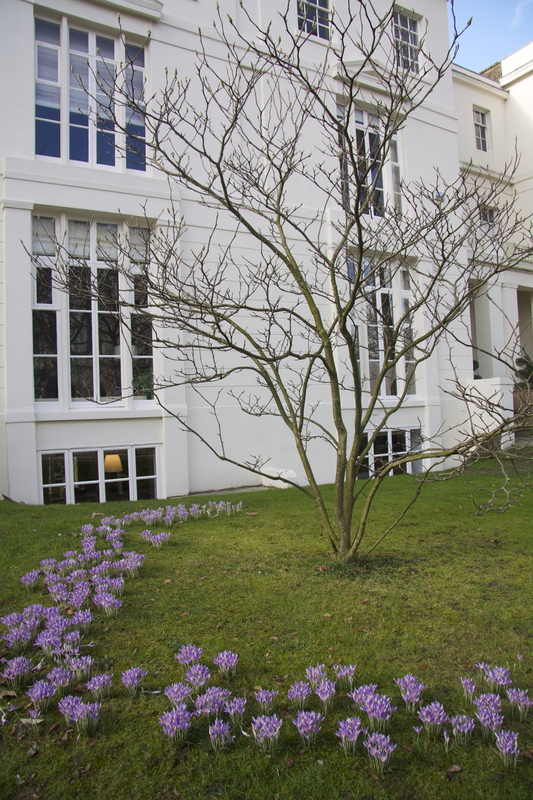 In the garden below, the design is clean and spare – a row of glossy topiaried trees densely underplanted with snowdrops, smart and pretty against the deep gloss of the cool grey and white paintwork of the house. 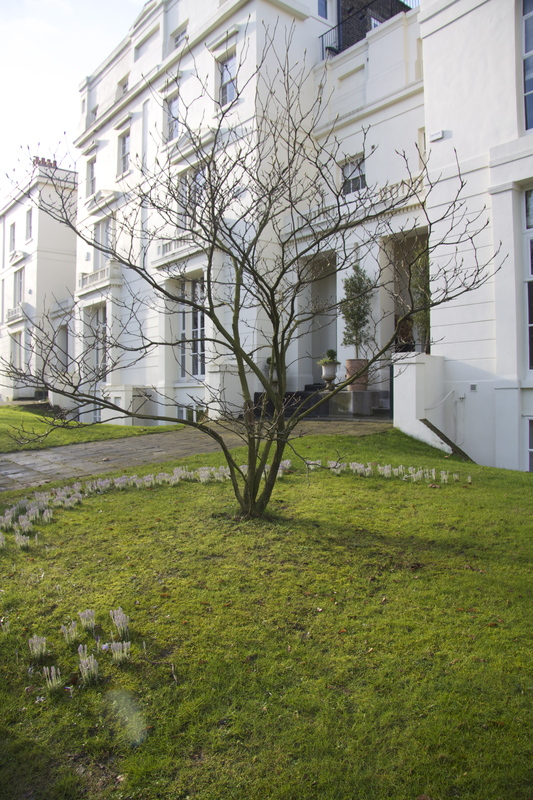 Back in Camberwell, my friend, the artist Charlotte Verity http:/www.charlotteverity.co.uk urged me to walk down the hill to see ‘one of the great London sights of spring’. 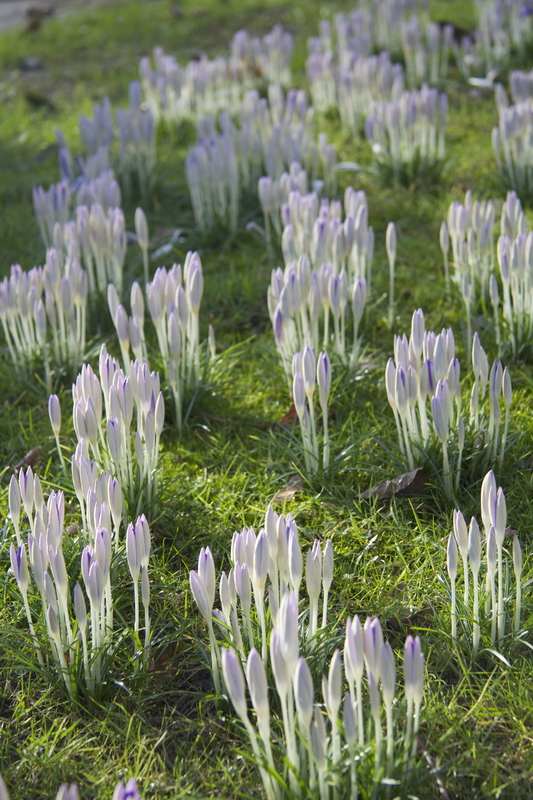 It was indeed brilliant to see such a wild sea of white snow drops and mauve Crocus tommasinianus in a world of quiet front lawns and too many recycling bins. 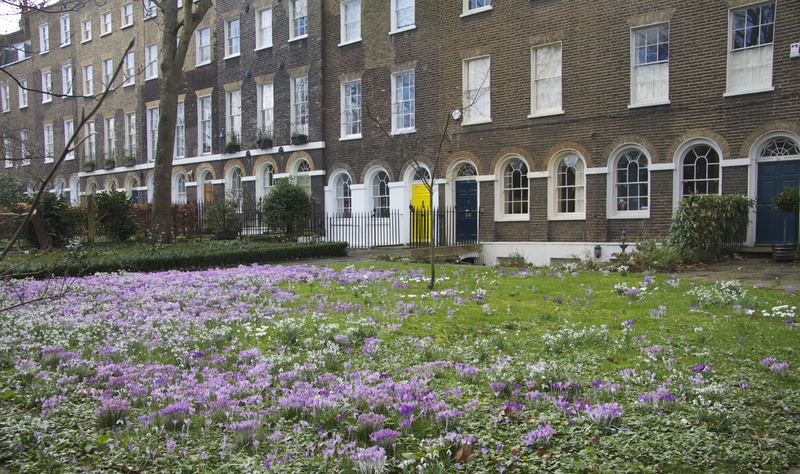 The great thing about this semi circle of purple is that everyone stops to smile at it for a few weeks and then the lawn returns obediently to green as the year progresses. 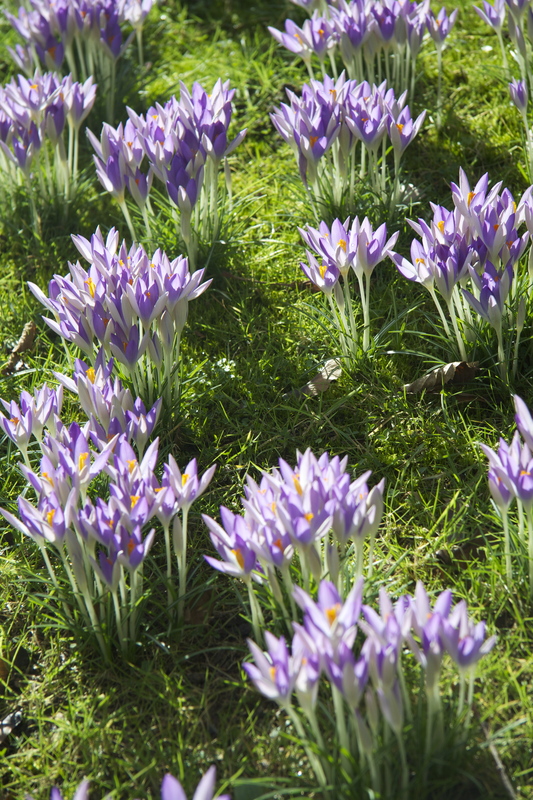 I love the idea of secret plantings of crocus. 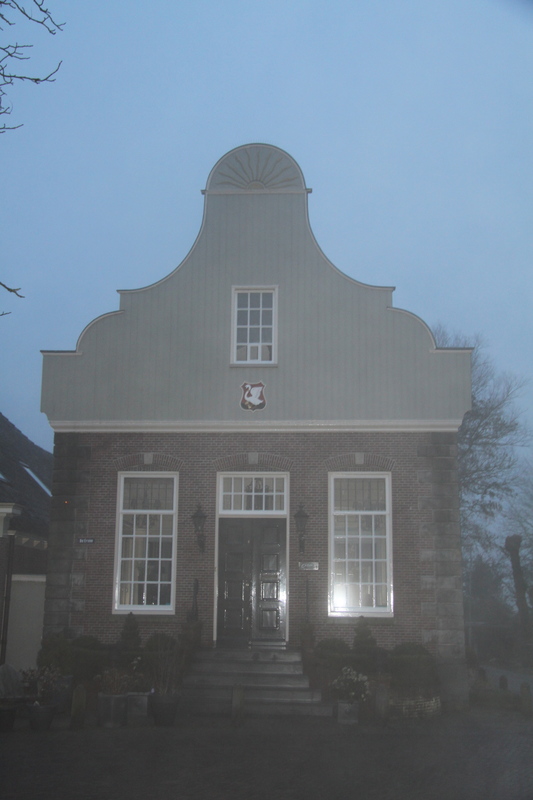 I have a friend who stealthily planted his wife’s initial in the lawn one September so that she would see a silvery-mauve letter ‘O’ suddenly emerge the following Spring. 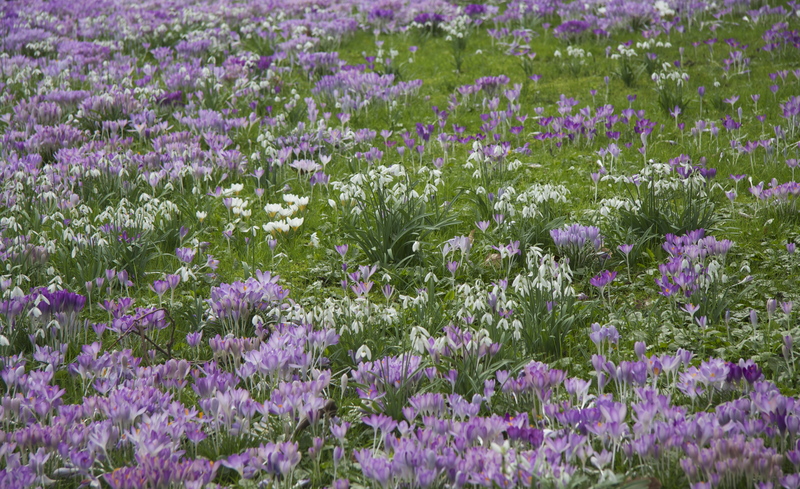 And I remember seeing a great photograph of long herbaceous borders in the garden at Petersham Nurseries – in a scheme designed, I think, by Mary Keen – in which the grass path between the borders was planted with crocus creating a playful, chequerboard effect for early spring. But enough of gorgeous spring days. 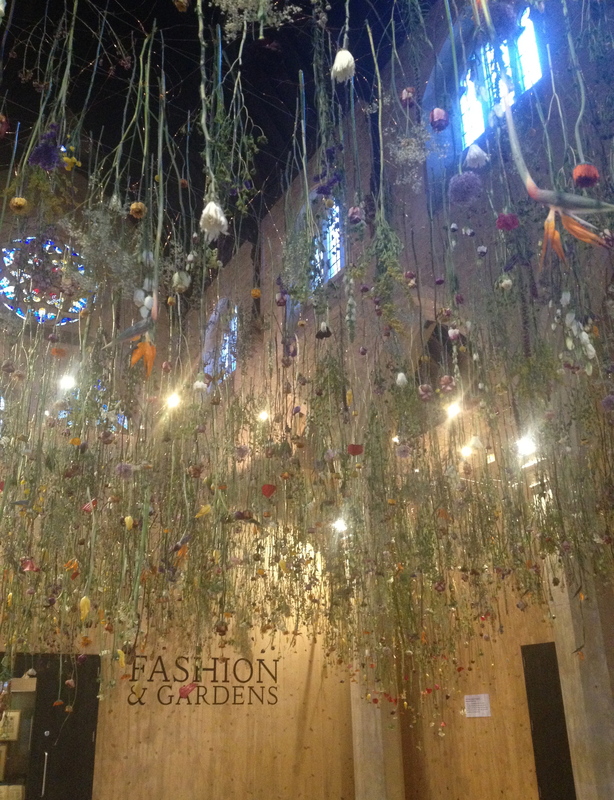 When the weather, even in London, was truly atrocious in the middle of the week, the only solution was to go flower hunting inside. 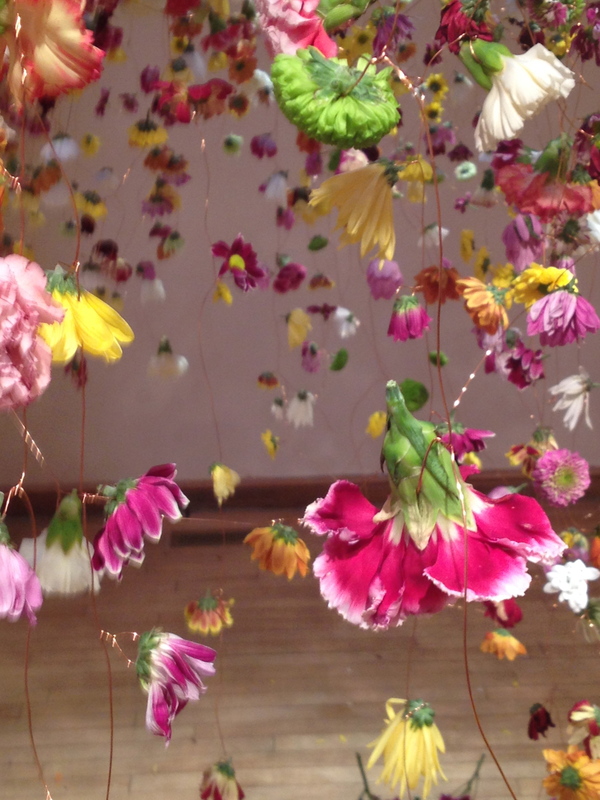 It is an absolute pleasure to come close to the pink, yellow and red flowers dancing deliciously and plentifully form the sky light on their spun frame of glistening copper wires. 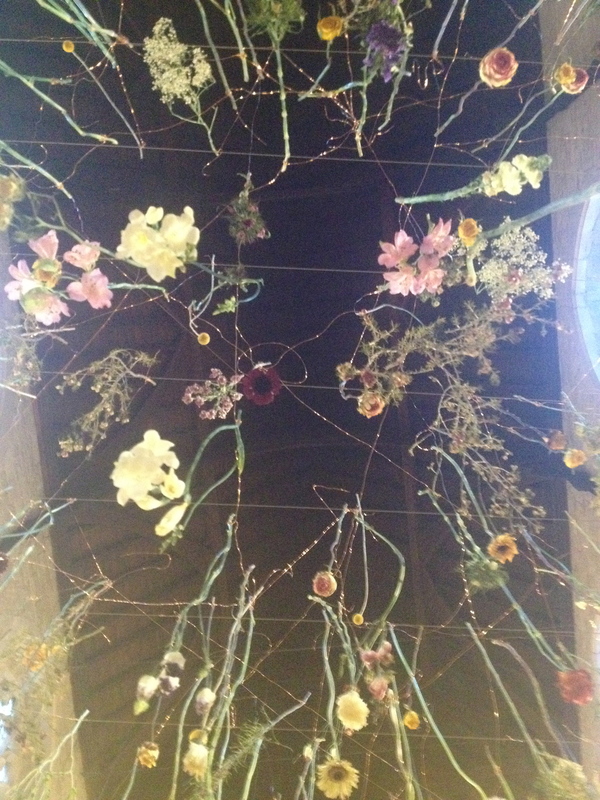 Daughter of a Head Gardener at Anglesey Abbey, Rebecca trained in Fine Art at Newcastle University and has been working in ambitious and original ways with flowers for seventeen years. 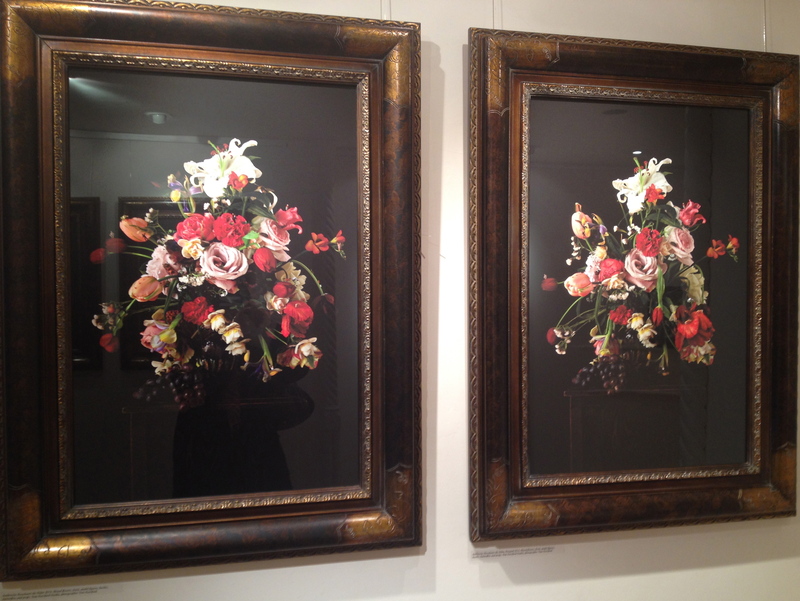 We have a very good conversation about the powerful tyranny of fashion in everything including flowers. 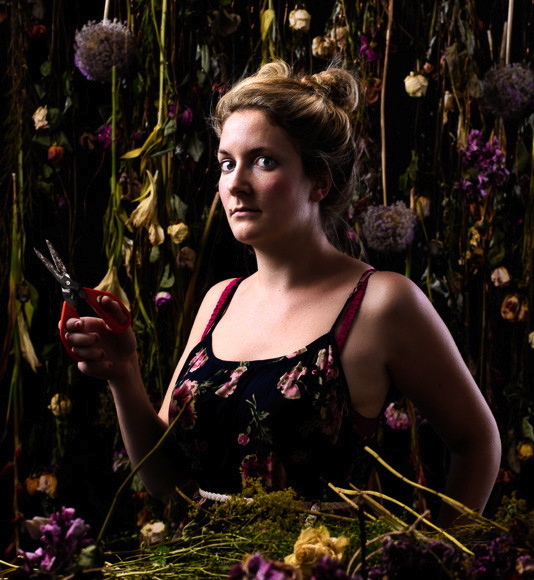 Rebecca also tells me more about some of her other works in the exhibition which explore her constant struggle with the ephemeral nature of cut flowers. 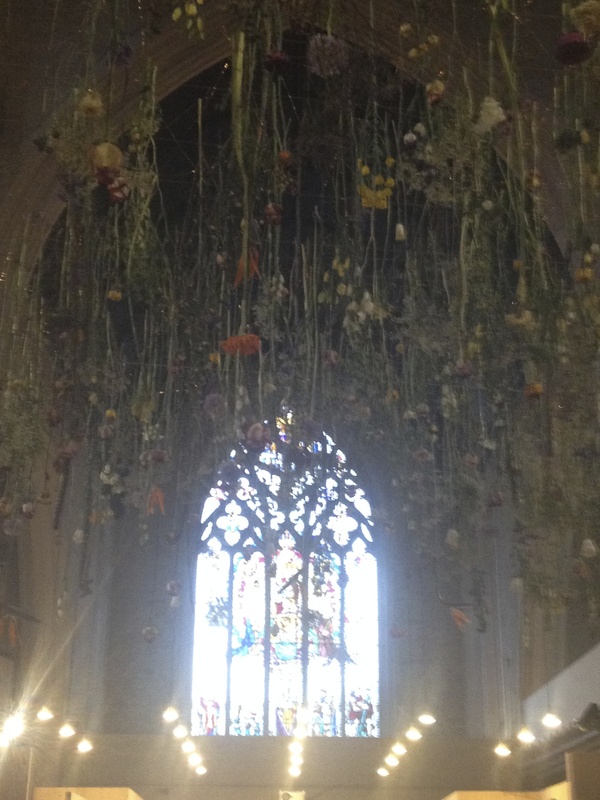 There were some wonderful smaller installations: glass cases filled with an alluring complexity of papery dried flowers, butterflies and other treasures. I really liked these: wonderful homages to Dutch Still Life painting with the Rebecca Louise Law twist of introducing tiny plastic figures into the scene – a Busby Berkeley capped lady swimmer with towel ready for a bathe, a few suited executives ploughing their way through the jungly foliage, a little family group of horses neatly trotting along a leaf. Alice suggested they provide bean bags to encourage people to lie down or that they copy the mirrored trolley idea at Norwich Cathedral which lets you admire the ceiling without strain. 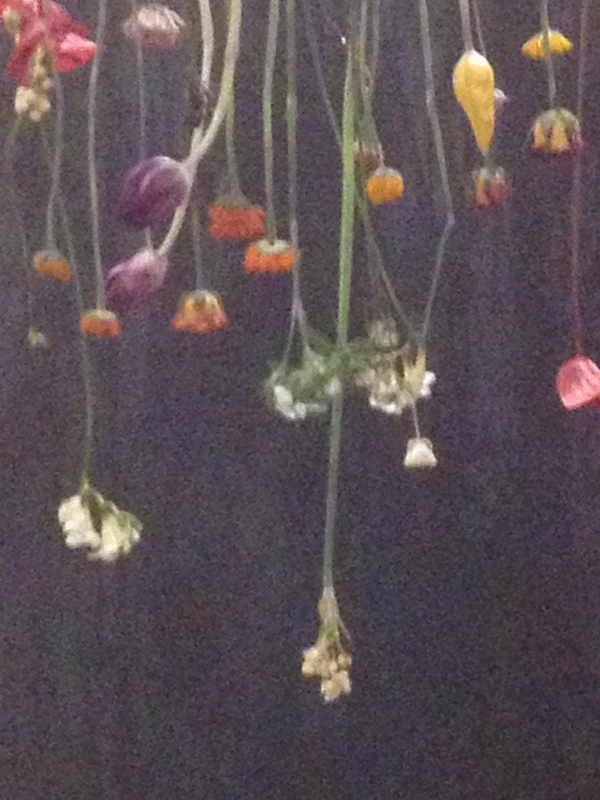 Alice and I could not resist one last plant fix and walked back to the Courtauld Gallery at Somerset House to see ‘A Dialogue with Nature, Romantic Landscapes from Britain and Germany’. A fantastic, ethereal painting in which a full moon floats brightly and symbolically (representing Christ) above a shadowy lakeside scene. 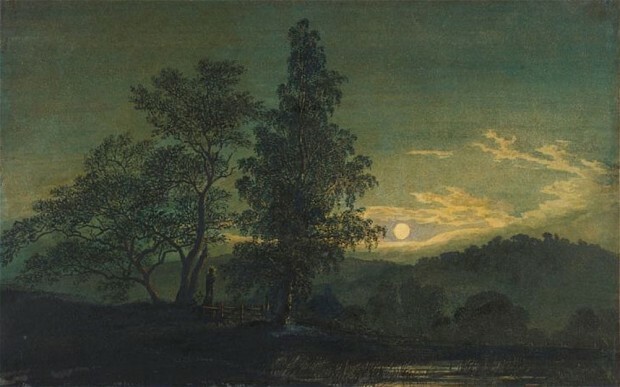 The painting is unusual because it is a ‘transparent’ – the moon’s almost halo-like clarity is achieved by inserting a piece of plain paper behind a hole cut in the painting. The idea was for transparents to be viewed in a darkened room, lit from behind by a candle, accompanied by music. An unsurpassably civilised solution to a wet and windy night. Tonight, however, I confess that I will be spending the evening with 7 boys and one girlfriend watching Wales v. France, Six Nations Rugby, on the telly. My name, Non, is the name of the mother of St David and I am 100% Welsh. 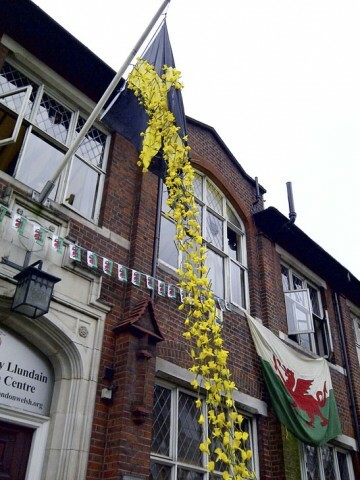 One final toast to Rebecca Louise Law who created this supremely cheerful trailing and fluttering column of daffodils for the London Welsh Centre on St David’s Day – March 1st 2011! 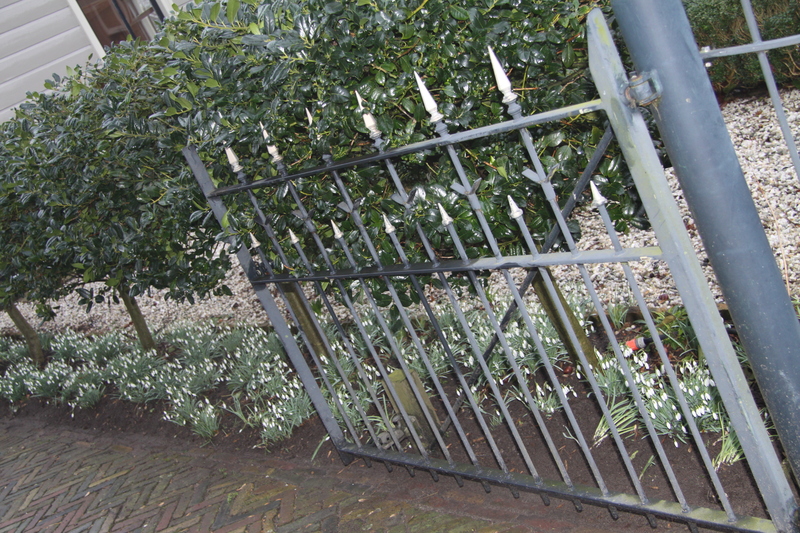 This entry was posted in Gardens and tagged A Dialogue with Nature, Amsterdam, Broek in Waterland, Caspar David Friedrich, Charlotte Verity, Chelsea Physic Garden, Christopher Woodward, Courtauld Institute Gallery, Crocus tommasinianus, Fashion & Gardens, Galanthus nivalis, Galanthus nivalis f. pleniflorus 'Flora Pleno', Galanthus plicatus 'Diggory', Galanthus plicatus 'Wendy's Gold', galanthus.co.uk, Garden Museum, Gardens Illustrated, Helga Crouch, Hydrangea preziosa, Naomi Slade, Snow Drop Theatre, Somerset House, Suffolk, Tom Hartford, Water Meadow, Wildly Botanical on February 21, 2014 by nonmorris.